Healthcare is one example. This week, the people of Missouri rejected another false policy put forward by big business in a disguise called “Right to Work.” By a landslide vote, the people of Missouri rejected a right to work voter initiative, which would have eroded workers’ rights to collective bargaining. This vote comes at a time when the nation needs a national renaissance of worker power. It is time for unions to remake themselves after 80 years of decline. 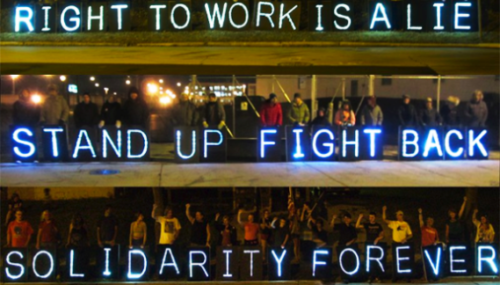 Unions need to become democratic in structure rather than hierarchical. Unions need to do two things to recover from decades of setbacks: (1) break from the Democratic Party and build independent political power, and (2) they need to represent all workers and communities, not just members of their union. The recent teachers’ strikes which occurred in multiple states showed teachers going beyond the limits set by unions. UPS, where workers voted 92% for what would be the largest strike in US history, is in the throes of debating a new contract, which Teamsters for a Democratic Union believes sells out UPS workers. Another example is the constant killings of black and brown people by police across the country. National consensus is developing against this brutality thanks to Black Lives Matter and others, as can the ‘take a knee‘ protests in the NFL. Despite pressure from President Trump and team owners, players are continuing to take action against racist policing by patriotically taking a knee during the singing of the national anthem. The movement must work to pull people from inside the system into the movement. A police officer’s family needs National Improved Medicare for All. A black police officer’s son will face racism from police officials just like any other black youth. Youth face outrageous tuition, school debt and wages too low to live on. Business owners know their employees would benefit from health care for all and that they can’t compete with businesses in nations that have national healthcare programs. People in the media see the misleading reporting they are required to produce to advance in their careers and know this is not why they wanted to become a journalist. There are people in every segment of the power structure that see the problems and want to help put in place solutions. This article was posted on Monday, August 13th, 2018 at 10:46am and is filed under Activism, Democrats, Disinformation, Donald Trump, Health/Medical, Hillary Clinton, Media, Propaganda, Social Movements, Solidarity, Unions, United States.